Surya Grahan or Partial Solar Eclipse timings in India are 1:32 pm to 5 pm. This Solar eclipse 2018 will be the last partial solar eclipse of this year. It should not be seen with naked eyes. Surya Grahan 2018: Partial Solar Eclipse will begin at 1:32 pm in India. 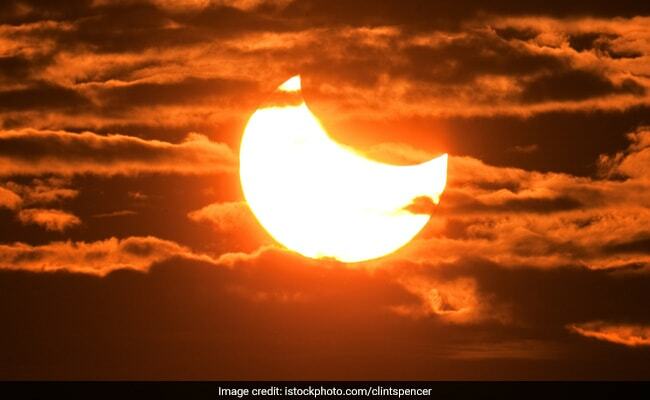 The world will get to witness a partial solar eclipse or Aanshik Surya Grahan today (August 11, 2018) - the last eclipse of the year. In a partial solar eclipse, the Sun, Moon and Earth are not exactly lined and the Moon only partly obscures the Sun's disk and casts only its penumbra on the Earth. So, the skywatchers will be able to see sun in a crescent shape during partial solar eclipse. Surya Grahan timings in India will be from 1:32 pm to 5 pm. The solar eclipse should not be seen with naked eyes. What is the date for Aanshik Surya Grahan or Partial Solar Eclipse? The date for Aanshik Surya Grahan or Partial Solar Eclipse is August 11, 2018. Where can Aanshik Surya Grahan or Partial Solar Eclipse be seen? 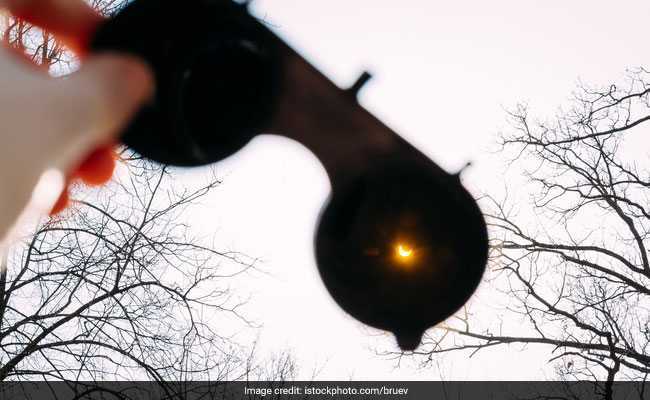 The Aanshik Surya Grahan or Partial Solar Eclipse can be seen from northern and eastern Europe, northern parts of North America, and some northern and western locations in Asia. When can Aanshik Surya Grahan or Partial Solar Eclipse be seen in India? Timings for Aanshik Surya Grahan or Partial Solar Eclipse: According to www.timeanddate.com, in India, the partial solar eclipse will begin at 1:32 pm. The maximum eclipse will be seen at 3:16 pm. The partial solar eclipse will end at 5:00 pm. Looking directly at the Sun, even for just a few seconds, can cause permanent damage to the retina of the eye. The intense visible and invisible radiation that the photosphere of the Sun emits is dangerous and exposure to these rays can result in impairment of vision. Since the retina is insensitive to pain, the effects of retinal damage may not appear for hours, so there is no warning of any injury. Viewing the Sun's disk through any kind of optical aid (binoculars, a telescope, or even an optical camera viewfinder) is extremely hazardous and can cause irreversible eye damage within a fraction of a second. Partial Solar Eclipse or Surya Grahan 2018 should not be seen with naked eyes. What gear should be used to see a solar eclipse? Scientists say that the only safe way to look directly at the uneclipsed or partially eclipsed sun is through special-purpose solar filters, such as "eclipse glasses" or hand-held solar viewers. Are sunglasses fit to see solar eclipse? 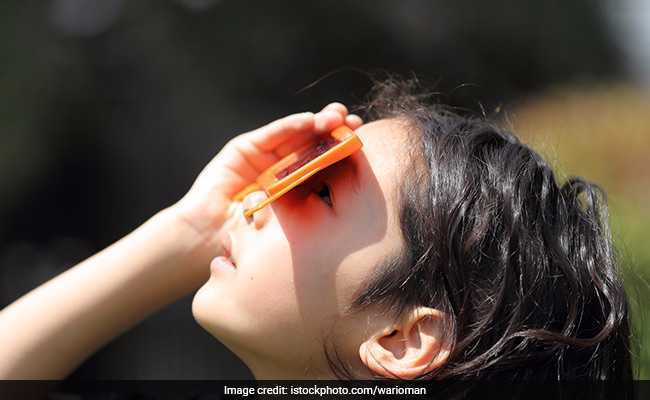 Homemade filters or ordinary sunglasses, even very dark ones, are not safe for looking at the sun; they transmit thousands of times too much sunlight, says NASA. Do not look at the sun through a camera, a telescope, binoculars, or any other optical device while using your eclipse glasses or hand-held solar viewer as the concentrated solar rays will damage the filter and enter your eye(s), causing serious injury, the aeronautics and aerospace research agency advises. What are common myths and superstitions related to solar eclipse? In India, people believed that solar eclipses are inauspicious as the Sun is not clearly seen and it could lead to an increase in bacteria and germs. People thus stopped cooking, eating or drinking at that time or go outdoors. People also prayed, took baths to purify themselves and the "evil" effects of the eclipse. Another common superstition is that eclipses can be dangerous for pregnant women and their unborn babies. Expectant mothers are told to not step out or undertake any activity at home. Can I look at solar eclipse with my spectacles on? The eyeglass wearers can keep them on and put eclipse glasses on over them, or hold the hand-held viewer in front of them. How to see solar eclipse without eclipse glasses or solar viewers? An alternative method for safe viewing of the partially eclipsed sun is pinkhole projection. What is a Pinkhole Projector? Can I make it at home? To make a quick version of the pinhole projector, take a sheet of paper and make a tiny hole in the middle of it using a pin. Make sure that the hole is round and smooth. With your back towards the Sun, hold a piece of paper above your shoulder allowing the Sun to shine on the paper. The second sheet of paper will act as a screen. Hold it at a distance, and you will see an inverted image of the Sun projected on the paper screen through the pinhole. Homemade filters or ordinary sunglasses, even very dark ones, are not safe for looking at the sun. What should be kept in mind while using eclipse glasses? When using or buying the eclipse glasses or hand-held solar viewers, they should be verified to be compliant with the ISO 12312-2 international safety standard for such products. Always inspect solar filter before use. If scratched or damaged, discard it. Read and follow any instructions printed on or packaged with the filter. Stand still and cover your eyes with your eclipse glasses or solar viewer before looking up at the bright sun. After looking at the sun, turn away and remove your filter - do not remove it while looking at the sun.